Fat Cat Gourmet Foods is a small, boutique condiments and hot sauce company based in Orlando, Florida. It’s the brainchild of the husband and wife team of Eyal (“Ale”) Goldshmid and Deborah Moskowiz. Eyal snatched what he could from Deborah’s garden to make sauces, condiments and other spicy concoctions to serve at their frequent cookouts. Friends and family raved, and soon a small following built around those creations. 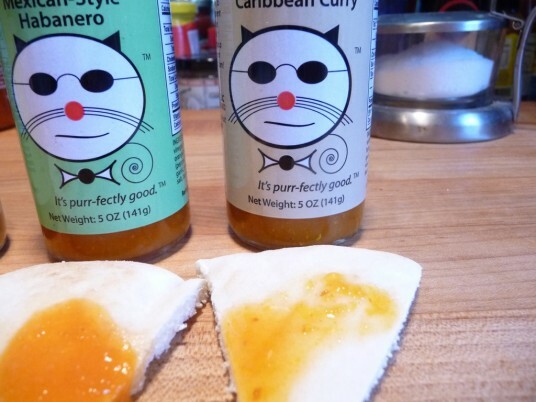 In 2011, the couple decided to take the plunge and start producing their recipes commercially. The result so far is their five initial hot sauce products reviewed here. Fat Cat’s homegrown origins remain at the heart of their products. They respect their ingredients and believe first and foremost in spotlighting the unique tastes and textures of those items. Like many hot sauces, theirs integrates various chili peppers, spices and other vegetables into the mix. But rather than test the limits of the Scoville scale, they prefer to highlight the flavors of the ingredients first. Each sauce features a complex blend of natural ingredients and pure flavors. Let’s get started with this whopping 5 sauce review and roundup beginning with their Fat Cat Surprisingly Mild Guajillo Ghost Hot Sauce – their mildest, up to their hottest Caribbean Curry Hot Sauce. Texture & Appearance: Darkest of the bunch, this slightly thick sauce has a nice pulp to it. It reminds me of a ranchera style hot sauce. 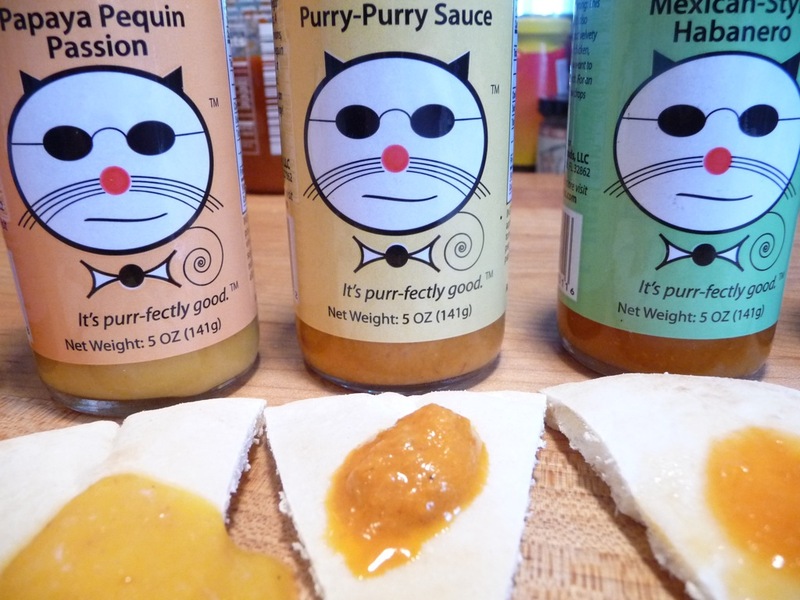 Taste Straight Up: A big hit of vinegar followed by the mild pungency of the guajillo pepper. A slight smokeyness is present from the Ghost pepper. Aptly named, as the Ghost pepper is extremely hot, but this mild version is astoundingly mild. I don’t know how they did it. Heat Level: – Fat Cat says 1 out of 10 on their scale. I say 1/2 out of 5. Since I don’t have a 1/2 Star we’ll continue – This is their mildest and I’d have to agree. Just a hint of heat. Great hot sauce for the girly-girls out there. 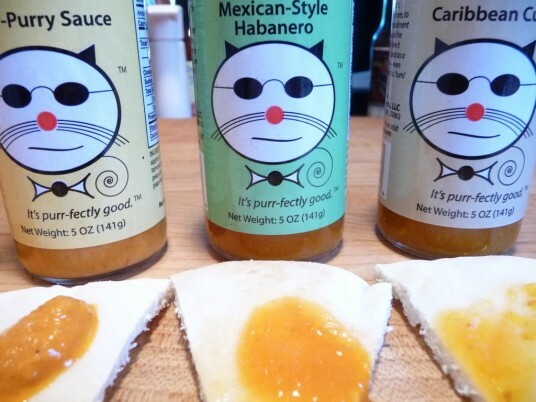 Final Thoughts: Delicious, smokey, easy-going hot sauce. Delightful. My second favorite of them all. A nice sauce that even a Chilehead would be proud to have on hand for guests or when you just want some flavor on those breakfast eggs you are cooking up. Texture & Appearance: The 2nd thickest sauce here, with quite a bit of pulp. No vinegar smell here. Just a strong fruity aroma from the papaya and pineapple juice. Taste Straight Up: Papaya is up front, along with a sweetness from the pineapple juice – with just a slight burn, mostly from the ginger and garlic. I sense a harshness from the garlic. This is a tough one to nail down. Marilyn: I love this sauce! I think the sweetness of the papaya with the pineapple juice easily dominates the flavors, and the garlic and ginger just accentuate the warm undertones while highlighting the sweetness. This is my favorite of the 5. Heat Level: – the light burn lingers on the front of the tongue for a few minutes. The pequin pepper can by quite hot, but in this recipe, it’s tamed quite a bit by the leading ingredients of papaya, pineapple, cider and oil. Final Thoughts: I’m not a fan of papaya, so this one is not for me. You’re on your own here. I like the addition of allspice, Marilyn does not. But it’s ever so slight, bringing a ever so slight hint of the caribbean profile. Marilyn: It’s true, I don’t care for allspice usually. But I don’t really taste it in this sauce. In this recipe it just lends a “jerk” aspect to the flavor. I love the Papaya Pequin Passion sauce. Texture & Appearance: The thickest of the bunch with a lot of pulp. Almost a mustard consistency and color as well. After it sits, the oil tends to separate from the pulp just a tiny bit. Nothing to get all “seepy” about. Great feel in the mouth with bits to chew, and a thick sauce to relish. Taste Straight Up: Our first foray into “hot” sauce here, this one actually made me sneeze. No surprise that the onion flavor is foremost, and a bit of oil comes through – then there’s the ginger and garlic combo again. Kind of a spiky sharp bite. I don’t understand the trend of sharp, raw onion in fruit-based hot sauces. I do love onion, but it seems out of place here and in other recent “yellow” hot sauces. Heat Level: – Back of the mouth and down the throat, the heat stays with you. Still on the mild side of heat. A unique flavor though. Final Thoughts: Based on the name, I expected to see peri-peri peppers, not the pequin. Nice bite to it both in heat and in the crunch of bits of the veggies. But there’s the ginger/garlic thing again. Marilyn: Again, I disagree. I like the onion/ginger/garlic combo. This is my second favorite of the bunch. With a great consistency and nice mild heat this would be good on anything. 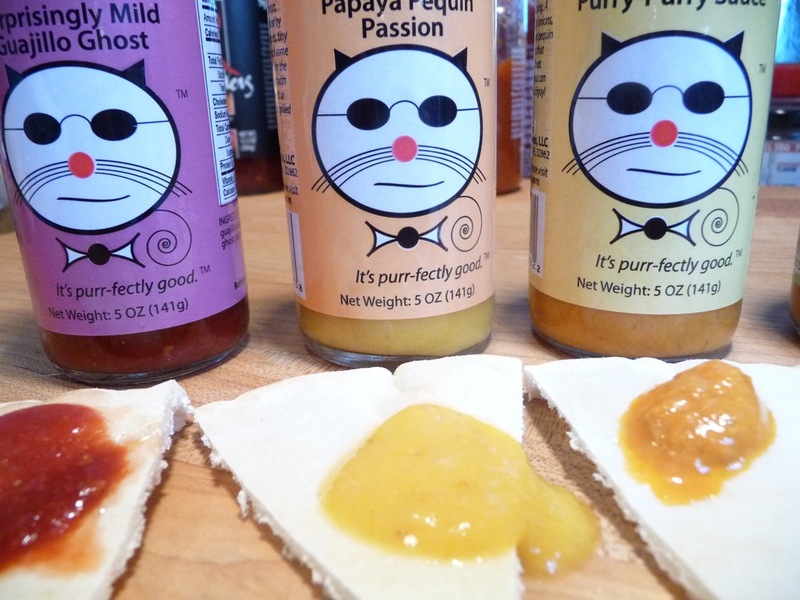 Check out all the recipes on Fat Cat Foods that feature their Purry-Purry sauce. Texture & Appearance: The thinnest sauce is indeed velvety smooth, just as the label describes. One smell and you know it’s a habanero sauce. Yet another winning habanero sauce that I am just learning to like. The texture and appearance is unremarkable. It’s kind of yellow… and hot. There ya go. Taste Straight Up: One of the most unique habanero sauces I’ve tried, the cider vinegar and carrot really temper the fiery pepper. Nice, bold, round taste. Quite good. Heat Level: – Now my head is sweating. A typical habanero heat level with a big bunch of flavor. Excellent! Final Thoughts: I’m just coming around to habanero sauces. They used to all taste the same to me. This one has big flavor; the habanero fruit comes through strong and bold. It’s slightly complex and interesting. Texture & Appearance: Another one on the thin side with tons of bits of the veggies and peppers. Very pungent aroma. The curry powder is strong in both aroma and flavor. Taste Straight Up: A very complex and big fruity flavor that compliments the curry and heat. Heat Level: – Their hottest sauce does not disappoint. True to Fat Cat’s philosophy, there are big flavors going on here. The nice heat level is almost secondary to the flavor. Final Thoughts: More sweat on the head! We’re talking big flavor with big heat. Excellent sauce. My favorite of the bunch. What an awesome palate of flavors! 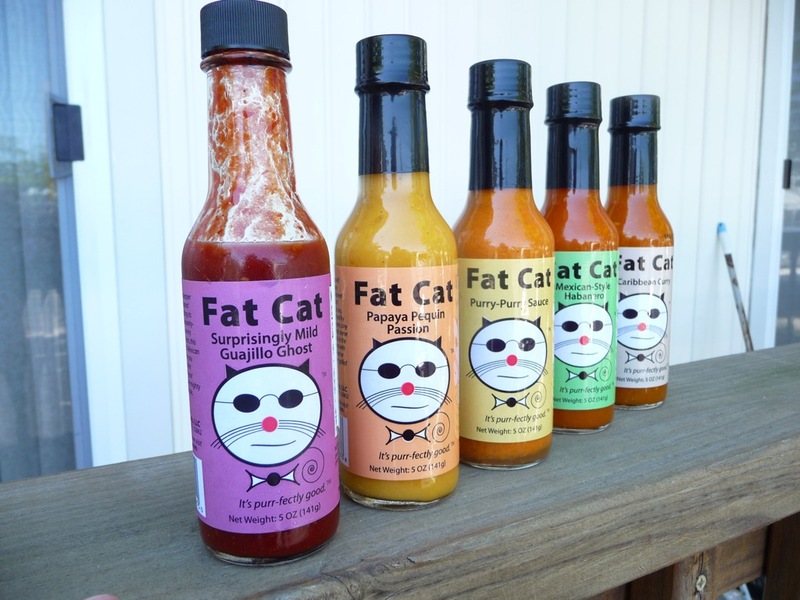 Fat Cat Foods has begun with a full line of sauces and flavors that will satisfy any hot sauce fan. I can’t wait to see what they have up their sleeves in the way of salsas, more hot sauce and other condiments. I hope they craft another dark, red sauce. And perhaps join the fray using the very unique Florida based Datil Pepper. Marilyn: I just love the Purry-Purry sauce above all. It’s thick and chunky, with a great flavor. Please consider going to their site and ordering all of their sauces, and pick YOUR favorite! 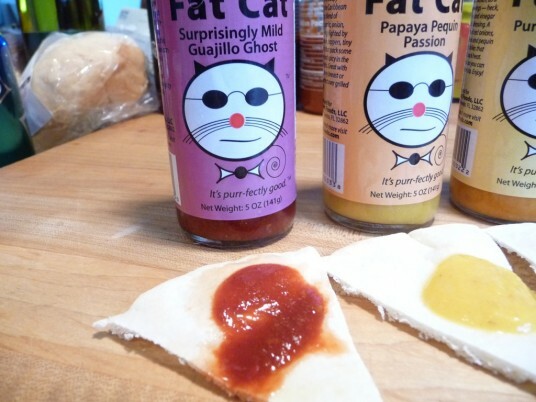 UPDATE: Fat Cat Foods is offering 20% off to our readers through the end of August 2011. Simply enter the Coupon Code “HOTSAUCEDAILY” at check-out to get your 20% discount! And be sure to listen to our HotSauceWeekly podcast featuring Eyal and Deb of Fat Cat Gourmet Foods! Thanks for the wonderful review. We’re absolutely thrilled that you liked our sauces and we really appreciate all the time and effort you guys put forth in crafting this thoughtful collection of reviews. Great pics too! Thanks very much. I’m with you! I love the Papaya Pequin Passion sauce. I use it on grilled shrimp, fish, chicken and pork chops. I love the sweet heat. Definitely a favorite. Marsha, I’m happy you agree! 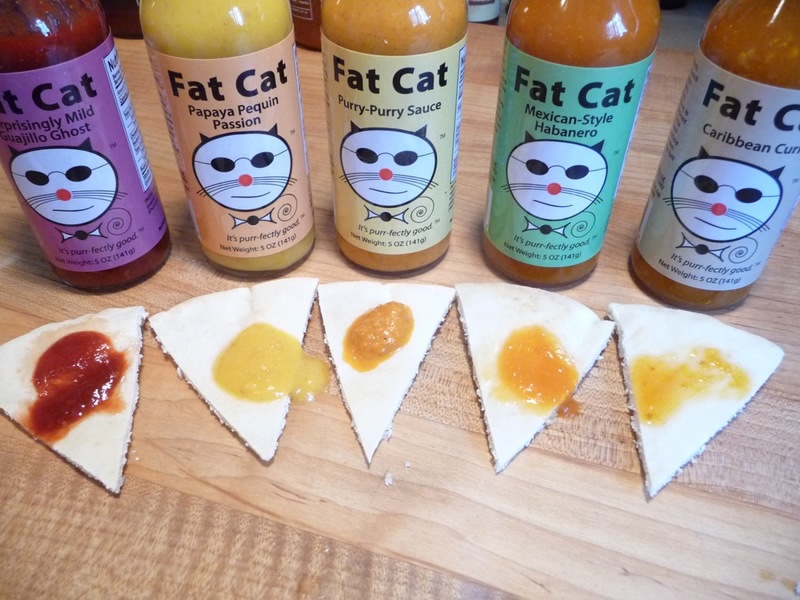 These are all fanstastic sauces, and the consistency, labeling, and flavors are all spot-on. It’s rare to find sauces that nail all those categories, but Eyal and Deb have done it! 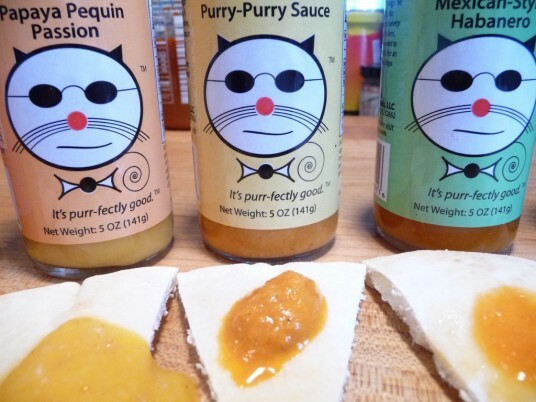 The purry purry sauce wins bonus points on the hilarious name too! Thanks, Chris. We like the name too. I give my wife all the credit for that one — by far the brains of this operation.